These sticky maple apple ribs are simmered in a maple syrup and apple juice broth then glazed and baked to sticky perfection! You know those foods that once you get the craving for them absolutely nothing else will satisfy? Sticky, finger-lickin’ ribs are one of those foods for me. Not even a dry rub rib will do, it must be sticky, glazed ribs so messy, an entire roll of paper towels and wipes need to be on standby so you don’t look like you just left the scene of a Dexter episode after eating. *This post is sponsored by Pure Canada Maple. This rack of ribs has been sitting in our deep freezer for months since we bought half a pig from a local guy at a nearby farm last fall. His pork has been some of the best I’ve ever tasted so I really have no idea why it took me so long to finally decide to cook these ribs. As we move closer to fall, I wanted to find a way to give the ribs a different spin than your typical summer BBQ sauce glaze. Enter maple syrup and apples. Apple season is revving up here in New York with local cider and fresh juice making their way into grocery stores right alongside the still prevalent zucchini in this weird seasonal transition time and it gave me the idea to essentially poach the ribs in the sweet fall flavor. Fresh apple juice and sweet pure maple syrup combined with the acidity from apple cider vinegar, make a poaching liquid that’s quintessential fall. 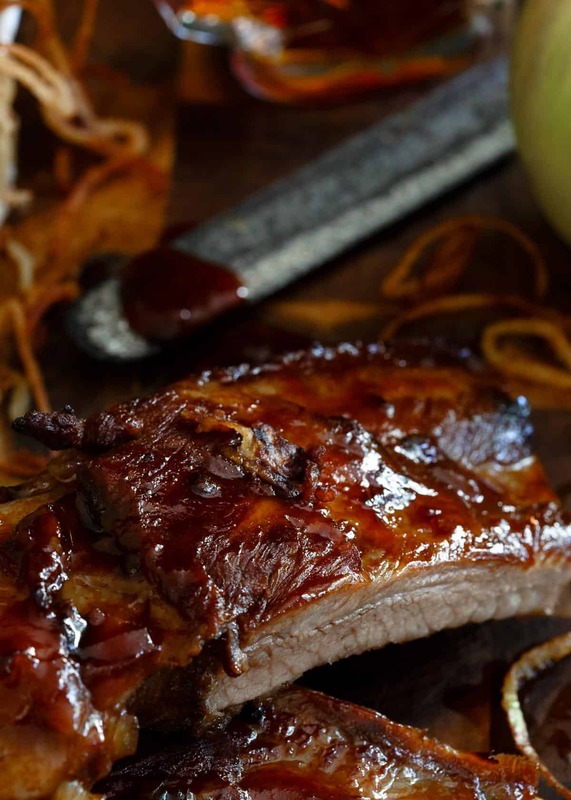 While you’ll easily find pork chops and apples on menus everywhere around here, I don’t think it’s as commonplace to find pork ribs with apples and these sticky maple apple ribs are just begging to be recognized as just as delicious a combination. 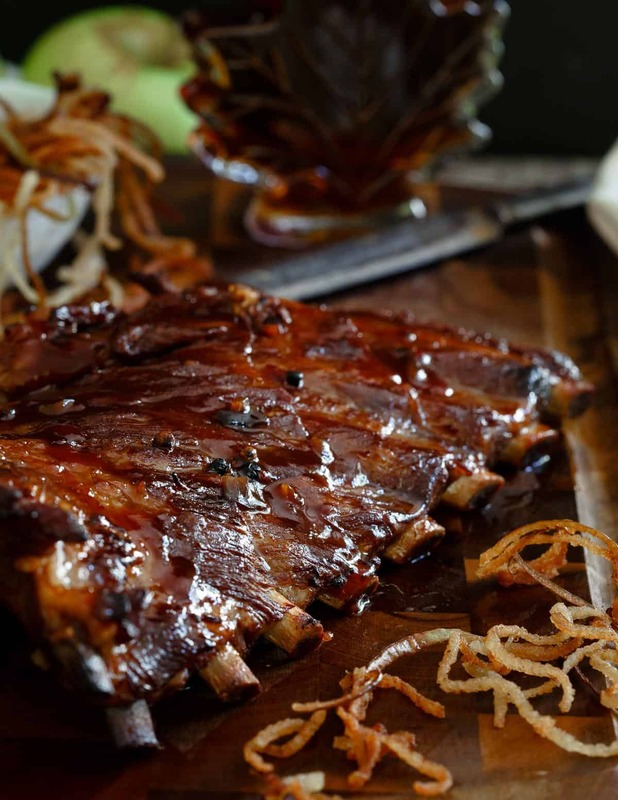 Looking for more rib recipes? Check out this slow cooker short rib ragu or these grilled BBQ short ribs and there’s always this spicy porter short rib chili for a good comfort meal! Poaching the ribs in the apple juice and maple syrup gives the flesh a slightly sweet taste that’s highlighted by the sticky maple apple glaze slathered on top as they finish off in the oven. 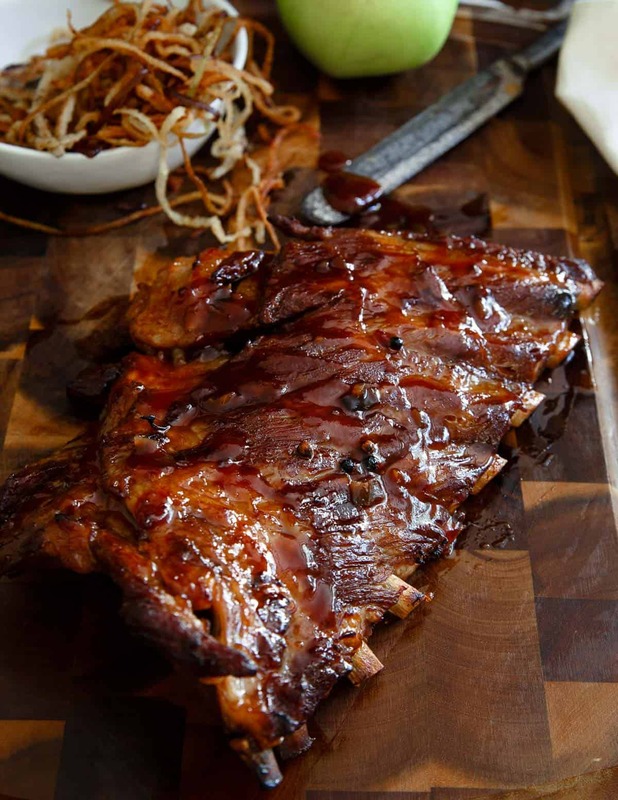 So many times ribs call for brown sugar either in the rub or the glaze but combined with the apple juice, maple syrup brings a much deeper, almost caramel type flavor to the recipe. I love that it also shows off its versatility as more than just a topping for sweet baked goods. 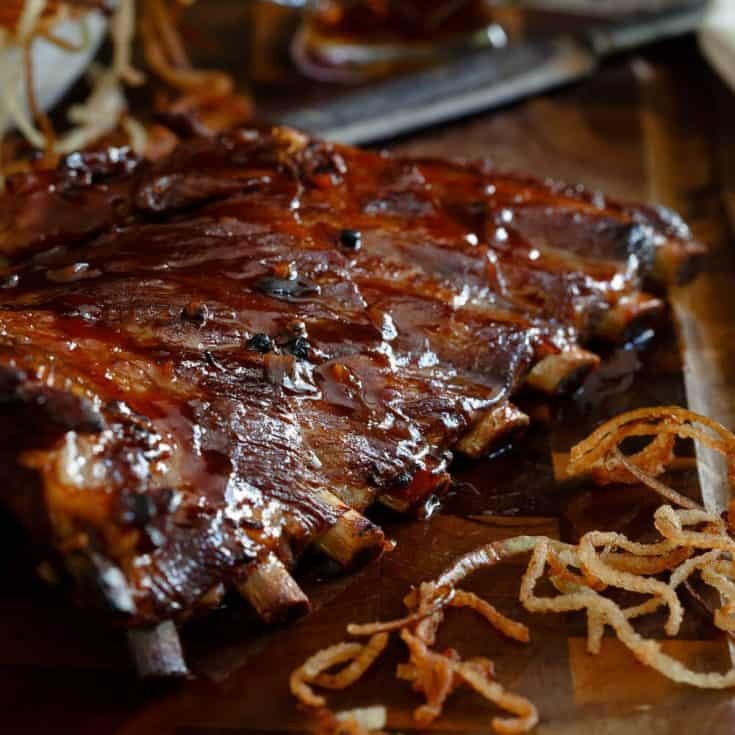 You’ll be sticky, greasy, dirty and happy at meals end, just the way you should be after devouring a rack of ribs! Combine all the cooking liquids in a large sauce pot and bring to a boil. Once boiling, add ribs, cover and cook for 35 minutes (you might have to cut the rack of ribs in half to fit it in the pot). Remove ribs from the pot, place in a baking dish and pour a ladleful or so of the cooking liquid over the ribs to keep moist. Set aside. Place all the ingredients for the glaze in a small sauce pot. Bring to a simmer and cook down until reduced and thickened. Brush both sides of the ribs with the glaze, place ribs meat side down in the baking dish and transfer to the oven. Cook for 15 minutes on each side. Finish under the broiler for 2-3 minutes. Brush with any extra glaze before serving. While ribs are baking, make the shoestring apple fries by placing a small sauce pot filled with enough oil (canola or vegetable is best) to fry over medium-high heat. Spiralize the apple and place in the hot oil in batches for 1-2 minutes until golden brown. Remove from oil and drain on a paper towel lined plate and dust with cinnamon before serving. I love the idea of adding maple syrup to ribs. It’s one of my favorite ingredients and I am sure makes the ribs amazing! I’m absolutely drooling over that glaze! Shoestring fried apples?? GENIUS!! I can’t wait to try this recipe this fall! Great recipe! I am bookmarking this one. Wellllll helloooo, GORGEOUS!!! This is insane! I just made this last night for my husband’s birthday dinner. I wasn’t sure how it would turn out, but followed the recipe exactly with the exception of the full baking time, the broiler and shoestring apples, because I ran out of time. This was fantastic! The ribs were tender, the sauce was delicious, I’m glad I made extra! My whole family loved it. Thanks for a great recipe!